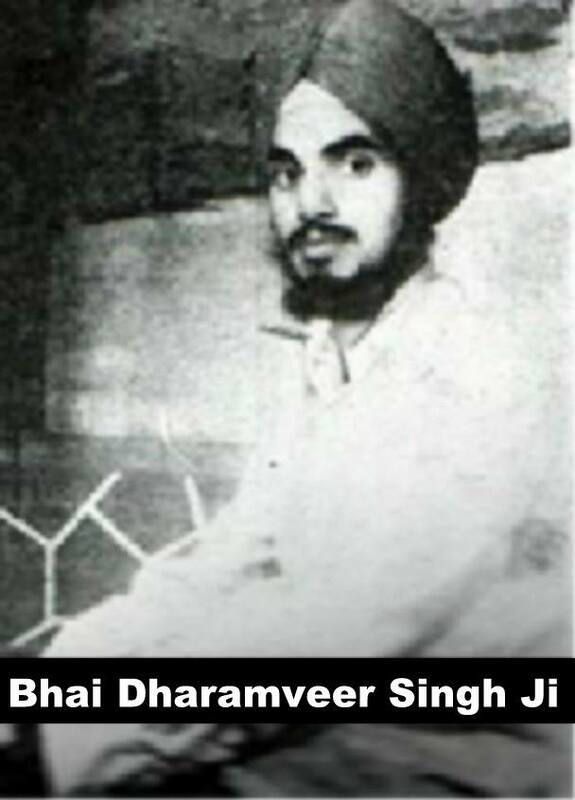 Bhai Dharamveer Singh was born in 15th March 1953 in the capital city of Delhi. His parents were Mata Baal Kaur and S. Lal Singh, who hailed from the village of Sahowaal in the District of Sailkot, Pakistan. His father, S. Lal Singh and his two brothers started doing construction work at a young age. The three brothers would travel to nearby villages to do the building work and on one occasion they had the fortune to meet Bhai Jawala Singh in the village of Bhiki, who lived in the most basic accommodation but had constructed a beautiful Gurdwara where Amrit-Bani was read daily and Langar was served to pilgrims. S. Lal Singh and his younger brother S. Gopal Singh were so influenced by the granthis of the Gurdwara – Bhai Sobha Singh and Bhai Tarlok Singh, they decided to stay in the village of Bhiki in Pakistan. After the turmoil that followed the formation of Pakistan, Bhai Lal Singh and Bhai Gopal Singh eventually met up with Bhai Sobha Singh and Bhai Tarlok Singh again in Amritsar. Here, Bhai Sobha Singh formed a Gurdwara and Bhai Tarlok Singh did Sewa of the Sangat just like him. With Satguru’s Grace they started Kirtan, Langar and Karah Prashad here just like the Bhiki Gurdwara in Pakistan. Four of the five families lived near this Gurdwara Sahib and Bhai Dharamveer Singh’s father and uncle (Bhai Lal Singh and Bhai Gopal Singh) also settled here with their families. By meeting this Gursikh Sangat they listened to Kirtan and Nitnem everyday and after a while Bhai Gopal Singh and Bhai Lal Singh started going to Akhand Kirtani Jatha Smagams and slowly both families took Amrit. A young Dharamveer Singh also took Amrit during his school education alongside which, he was taking the Shiromani Committee’s religious exams. After passing his tenth grade Dharamveer Singh learnt from his uncle Gopal Singh, the art of making Kirpans and he started up a factory to do this, which ran for five years. He was also very keen to learn Kirtan and was taking lessons in playing the Harmonium, Tabla and the Dilruba. Since the start of his there were many Gursikhs who used to come to him. He had a lot of respect for them and did as much Sewa as he could for them. If any Gursikh needed money he would be happy to help and never asked for it back, even if he could only just get by himself. Bhai Dharamveer Singh would always accompany Bhai Fauja Singh for religious causes and he even came under attack from stones and acid bottles during a protest and was arrested and wrongly imprisoned for three months. He joined Bhai Fauja Singh for the last time on 13th April 1978 and attained Shaheedi at a young age, his marriage date had just been set for that year. Dhan Guru Dhan Guru Pyare! Parnaam Shaheeda Nu!